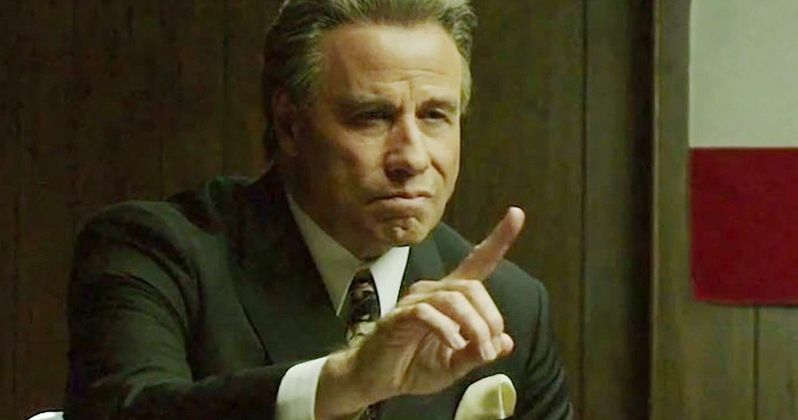 The folks distributing the new John Travolta movie Gotti aren't content to just let the movie bomb. A strange new marketing campaign for the movie is specifically targeting critics who panned it, stating that audiences have loved it so far. The numbers, at least on the surface, would seem to back this new marketing campaign up, but something still seems a little bit fishy when digging in deeper. The new advertisement going around reads as follows. "Audiences loved it. Critics put out the hit. Who would you trust more? Yourself or a troll behind the keyboard?" Much of this has to do with the fact that Gotti, which is in part being distributed by MoviePass, earned a rare 0 percent rating on Rotten Tomatoes. Yet, as their new ad boasts, the audience score is very high. Suspiciously high, one might say. As of this writing, the movie has a 75 percent audience rating with an eye-catching 6,921 ratings. That's where this whole thing begins to get a little strange, as pointed out by Dan Murrell of Screen Junkies on Twitter. Gotti, which opened on far fewer screens and had a much lighter marketing push, has more audience ratings than Ocean's 8 and nearly as many as Incredibles 2, which made $180 million in its opening weekend. Gotti didn't even clear $2 million. A somewhat more comparable movie, Beirut, which opened earlier this year on 700 screens, currently has 711 audience reviews. Something doesn't seem to be adding up. Rotten Tomatoes ratings have been tampered with in the past, or at least allegedly tampered with. Perhaps the most famous recent example is with The Last Jedi. Though, that movie did actually turn out to be rather divisive and had the opposite problem, with critics loving it and audiences coming out lukewarm, at least on average. Dennis Rice, who headed up the marketing for Gotti, had this to say in an interview with Deadline, which sheds some light on the situation. "The movie performed very well in New York, Los Angeles, and the five cities John Travolta and Kelly Preston toured (Phoenix, Dallas, Chicago, Miami, and Philadelphia) and we will most likely expand in those cities. That shows the power of publicity. What is shocking to me is that 80% of audience members on Rotten Tomatoes and 4 out of 5 of them on Fandango liked the film. Clearly critics are out of touch with the people who actually vote with their pocket books. It makes me wonder if the press and critics don't want a movie to succeed because they incorrectly think we are glorifying John Gotti." It's one thing for critics and fans to disagree on a movie. It happens all of the time, but the degree that it has allegedly happened with Gotti seems at the very least improbable. Dan Murrell did a bit more digging and says, "I went to take a look at the written reviews on RT and of the first 58 reviewers with an available profile, 45 had created their account in June 2018. Out of these 45, 32 have only reviewed Gotti, 10 reviewed Gotti and another movie (7 times it was American Animals for some reason) and 3 had more than 3 reviews." Well worth noting, MoviePass also has a stake in American Animals. Coincidence? Probably not, as their service, according to Deadline, accounted for 40 percent of the sales for Gotti over last weekend. This, at the very least, seems like a fairly desperate way to try and sell what may very well be a bad movie. You can check out the new ad floating around online for yourself below.